If you know one thing about me it's that I'm a sucker for a good skirt. They're just the perfect thing for my body and pretty much for any occasion in my life right now. Check out more below! I have the wonderful "problem" of having an Anthropologie downstairs from my office. So of course I pass by their windows multiple times a day and always see whats new. It's honestly a blessing and a curse because I just want to shop all the time! Case in point: this skirt. I saw it in the windows early last week and I loved the shape of it. It's the shape I know fits my body the best and the color was just so perfect for spring! After work last week, I stopped in store and tried it on. The 6 fit like a glove and I was sold. I even loved the little buttons on the front, it was just a great touch. I also totally forgot to take a snap of the back, which is another little fun part of the skirt. It's a bit pricey for a simple coral skirt but this is going to be a closet staple of mine so I didn't mind spending a little more! I've already worn it to work and out with friends for a drink. It's perfect for every occasion! Now if they could just make it in navy we'd really be talking! I love this color! The fit of the skirt looks perfect. I am so excited to start rocking more bright colors. 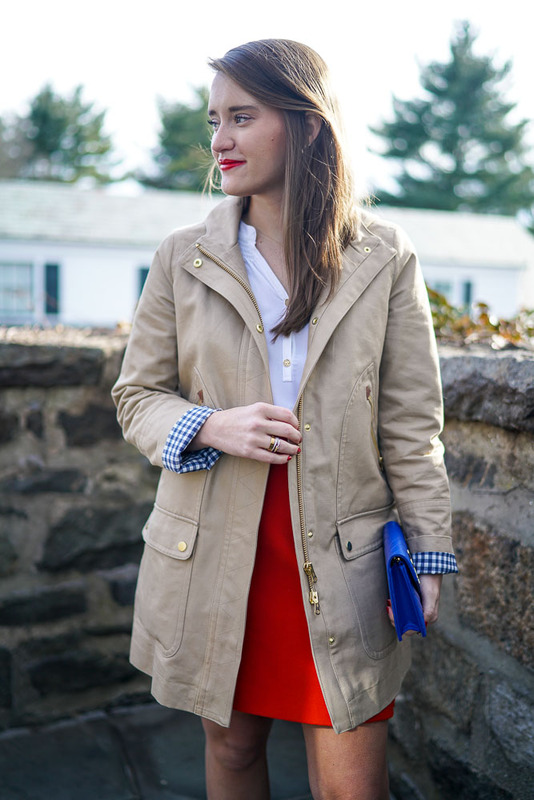 Love the way it looks on you - and love how the coral and khaki trench go together! SO pretty! Absolutely love the blue and red! Gorgeous look! That skirt is adorable! Elsa's do not look great on me because I'm an hourglass shape but they're so cute. This look is great! Casual enough to wear having lunch and running errands, but pulled together enough to wear it for a day at the office. The red is such a fun statement! 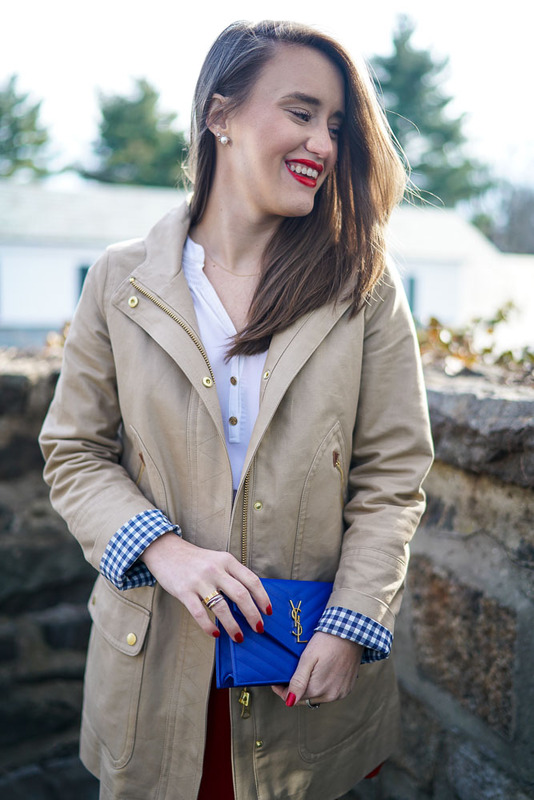 I love that blue clutch! I've been eyeballing this coat. Looks great on you! Would you say it's worth the price? or wait for it to go on sale? Absolutely love this! 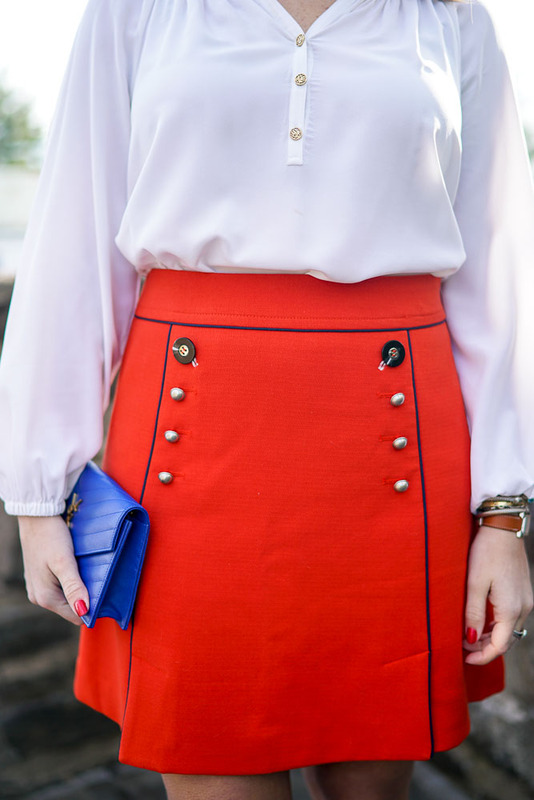 I'm a sucker for a sailor skirt, and this is just so cute and classic! You look stunning! Gorgeous as always!